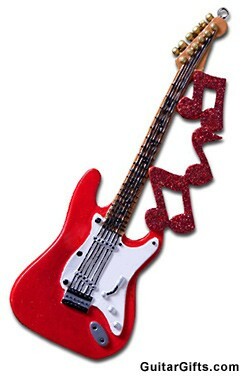 Guitar with Notes Ornament – Brighten up the holidays with this amazing Guitar with Notes Ornament. A colorful Christmas tree decoration fashioned after the style of an electric guitar with glittering music notes along the neck. A quality guitar ornament with intricate detail.Made of sturdy poly-resin material. Approx. 1.75″ x 4.75″.